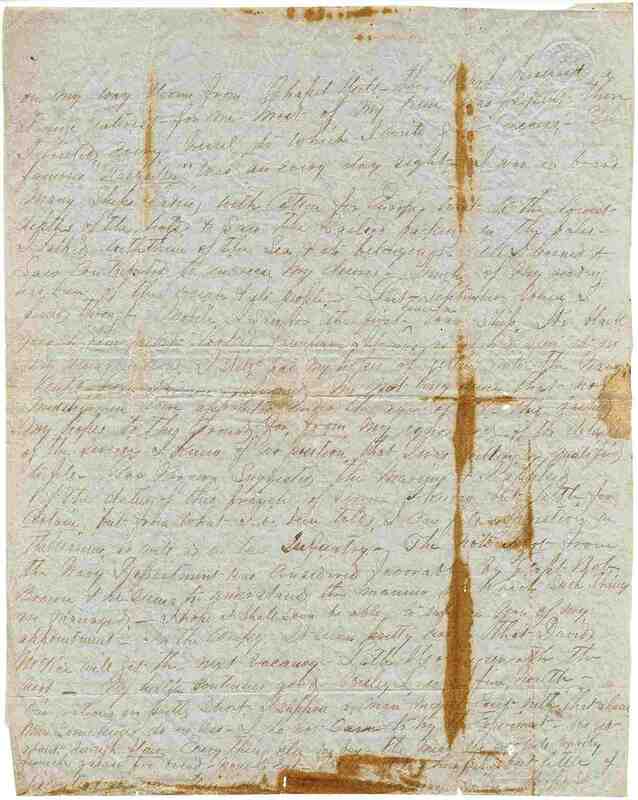 Item description: Letter, dated April 24th, 1863 from Ruffin Thompson to his father, William H. Thompson. In it he recounts details of camp life and his failed attempts to transfer to a less physically taxing position. Item citation: From folder 6 in the Ruffin Thompson Papers, Southern Historical Collection, Wilson Library, University of North Carolina at Chapel Hill. I have been deferring writing for several days longer than I intended, hoping to give you the final result of my experiment in “office seeking”. 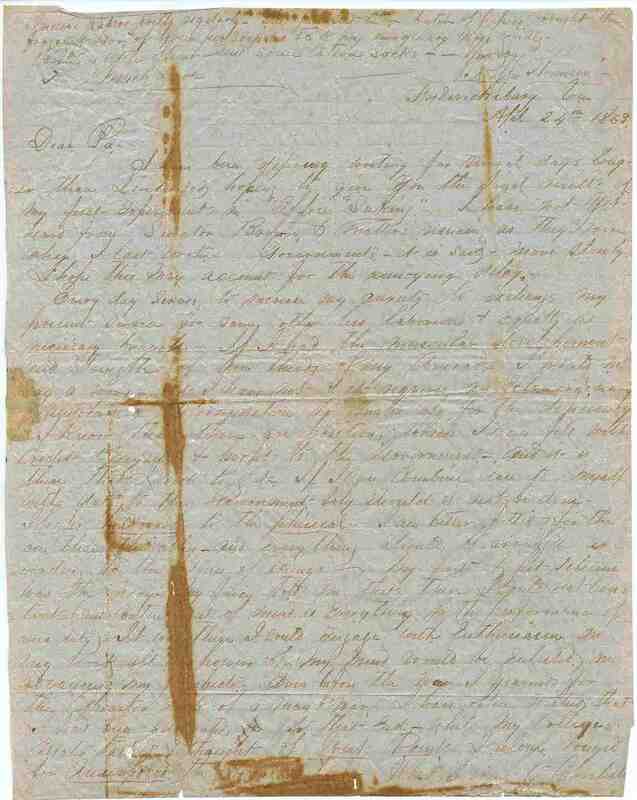 I have not yet heard from Senator Brown, and matters remain as they were when I last wrote. Governments, it is said, move slowly. I hope this may account for the annoying delay. Every day serves to increase my anxiety to exchange my present service for some other less laborious and equally necessary branch. If I had the muscular development and strength two-thirds of my comrades I would not say a word. But I have not, and it requires an extraordinary expenditure and determination to make up for the deficiency. I know that there are positions which I can fill with credit to myself and profit to the government, and it is one of these that I wish to get. If I can combine ease to myself with duty to the government, why should it not be done? I prefer head work to the physical – I am better fitted for the one than the other, and everything should be arranged according to the fitness of things. My first and pet scheme was the navy. My fancy told me that there I could rest content (and contentment of mind is everything in the performance of one’s duty). It is there that I could engage with enthusiasm, in my work; all the powers of my mind would be enlisted in advancing my prospects. Even before the war I yearned for the quarter deck of a man-of-war. I have often wished that I had been educated for that end, while my college mates thought and talked of West Point, I alone longed for Annapolis, the naval school. When I went to Charleston on my way home from Chapel Hill, the wharf possessed a strange interest for me. Most of my time was spent there. I visited every vessel to which I could gain access. The famous “Nashville” was an everyday sight. I was on board many ships landing with cotton for Europe – went to the lowest depths of the holds, and saw the sailors packing in the bales. I talked with them of the sea and its belongings. All I heard and saw contributed to increase my desire. Much of my reading has been of the ocean and its people. Last September, when I passed through Mobile I saw for the first time a war ship – its black guns and “bluejackets” looked familiar. It was as I had seen it in my imagination. I still had my hope of getting into the navy, until Gov. Brown informed me not long since that now midshipmen were appointed over the age of 18. This dashed my hopes to the ground, for from my ignorance of the details of the service I knew of no position that I was willing or qualified to fill. Gov. Brown suggested the marines, and I applied. Of the duties of this branch of the service I know but little for certain, but from what I’ve been told I can fill a position in the marines as well as in the infantry. The note I got from the Navy Department was considered favorably by Capt. Bob Brown, and he seems to understand the manner in which such things are managed. I hope I shall soon be able to inform you of my appointment. In the company it seems pretty certain that David McRea will get the next vacancy, Lath Hollingsworth the next. My health continues good. Wesley L. is in fine health. Our rations are pretty short. I suppose a man might exist with that alone. men sometimes do on less – I do not care to try the experiment. we get about enough flour, – everything else we buy. The meat we get will barely furnish grease for bread – none to eat. We try to be cheerful, but little of discontent is seen. There is some [text obscured] of increase soon – I hope so. I receive papers pretty regularly. The pea enclosed in one batch of papers brought the fragrant odor of green pea soup, etc, to my imagination vividly. Write a little oftener. Send some cotton socks. More about this item: William H. Thomson, born in Hillsborough, N.C., lived there and in Chapel Hill, N.C., attending the University of North Carolina. He taught in Alabama and attended medical school at Transylvania University. He practiced first in Tennessee, where he married Hannah Lavinia in 1831. In 1835, Thomson moved to Hinds County, Miss., where he lived thereafter at a place called Spring Ridge, combining medical practice with the operation of a small plantation. This entry was posted in Southern Historical Collection and tagged camp life, food shortage, Fredericksburg, Ruffin Thomson, William H. Thompson. Bookmark the permalink.